The Rabbi with a Blog (Rabbi Jason Miller): Could Miguel Cotto Be Sued By Orthodox Union Over Kosher Tattoo? Could Miguel Cotto Be Sued By Orthodox Union Over Kosher Tattoo? Boxer Miguel Cotto lost to Floyd Mayweather Jr. last night in a unanimous decision in the MGM Grand Garden Arena in Las Vegas. 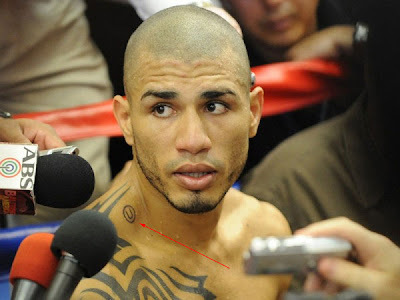 As I've written about before on this blog, Miguel Cotto sports a tattoo on his right collarbone that represents the kosher symbol used by the Orthodox Union (a circle containing the letter "U"). Cotto got the well-known and internationally recognized symbol tattooed on him as a gesture for a Jewish friend. Seeing Cotto's tattoo again last night during his fight made me wonder if there might be any legal ramifications to Cotto sporting a trademarked image in such a public way. The Union of Orthodox Congregations of American is the largest kosher certification agency in the world with its hekhsher (kosher certification symbol) on over 500,000 products worldwide. The OU, as it is commonly called, has been unrelenting in its protection of its famous trademark. As the most recognized kosher symbol, many food manufacturing businesses (especially in the Far East) think that the OU symbol is a generic kosher code and place it on their product without permission. As Sue Fishkoff reported in her book Kosher Nation, the OU employs a large legal department whose mission is to locate violations of usage of the OU symbol anywhere in the world, issue a cease and desist order, and file a suit if there's no compliance. In the past week I've read two articles about ongoing lawsuits filed by the Orthodox Union against companies using the OU symbol. Watching Miguel Cotto dance around the ring last night with his OU tattoo in full sight, I considered if this might be a trademark violation on the radar screen of the OU's legal department. The Orthodox Union recently sued a Maine organic dairy for trademark infringement. The OU claims that Maine’s Own Organic Milk Company L3C used the OU trademark without authorization. The Orthodox Union said it initially contacted the dairy about its unauthorized use of the hekhsher in June 2010 and the dairy, known as MOOMilk, applied for certification that month and received an initial inspection, but the dairy never paid the fees and continued to use the kosher symbol on its cartons without authorization. The Orthodox union said it’s harmed by the unauthorized use of the mark, and that kosher consumers are likely to be confused and misled when they see it on MOOMilk’s products. That's the most common example of violation against a kosher symbol. But the OU also has to deal with companies using the OU symbol as an innocent mistake. Also this week it was reported that a coffee roastery in New Zealand, Christchurch's Underground Coffee, is being sued for using a logo that is similar to the OU's registered trademark. 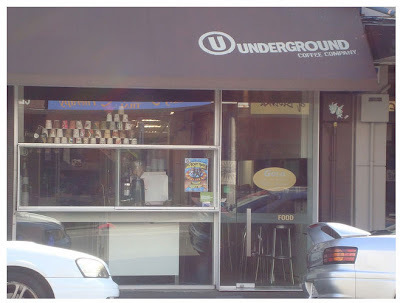 Underground Coffee has been using that logo since 1998, but it only became known to the Orthodox Union recently when Starbucks stores in New Zealand began selling the product. The OU claims that the coffee's logo is "likely to deceive or cause confusion" to consumers. Apparently many travellers to New Zealand asked local rabbis if Underground was kosher and others had reported it to the union as an infringement. There's no confusion as to Miguel Cotto's kosher status and it's entirely possible that the Orthodox Union appreciates the free publicity. But who knows what the OU legal department will think of Cotto's tattoo, which could be considered an unauthorized use of a registered trademark. Legal experts: What do you think? Does he have split hooves? i don't think he could be sued but as am not expert in this matter it just my personal thinking . No, but he is likely ruminating quite a bit after losing the fight. The issue in Trademark law usually boils down to an issue of likelihood of confusion. Trademark law is designed to protect consumers by ensuring that the trademark indicates the source (or in the case of OU, supervision status) of the item being sold. So in the case of commercial restaurants, coffee shops, etc., the use of OU can (and probably mostly will be) confusing since the mark is relied upon not only by knowledgeable orthodox Jews who might recognize that a restaurant serving milk and meat can't likely be supervised, but vegetarians, lactose intolerant, Halal eating muslims, and others who might not be that sophisticated would be confused. In the case of an OU on a person, no real likelihood of confusion for anyone other than Dahmer exists.